Did you think we had forgotten about you? I cannot believe how long it has been since we have posted. Julie and I took a nice long break from the Supper Club and it was great to refresh and recharge. With the entire family home over the holidays, it was nice to just spend time together. We did a lot of nothing at all. My girls and I have been obsessed lately with watching the Gilmore Girls series. When the revival of the show was released last November, I had several friends who went crazy. I had heard of the show, but since I didn’t watch it when it was on earlier I didn’t know what the hype was all about. My oldest daughter, home from college, had been watching and got my younger two daughters on board and they got me on board. We had several marathon days over the holiday break where we just snuggled in and binged. We are almost at the end of season 6 (there are 7 seasons) and then we get to watch the revival. I love the quirky characters and the quaint little town of Stars Hollow. There are so many references to movies, shows, music, etc. from “back in my day” that make it hilarious. In addition, it is worth watching just to make fun of the fashion choices from the early 2000’s. It’s a great feel good show. Needless to say, most of the cooking I did once I got through Christmas day was simple. 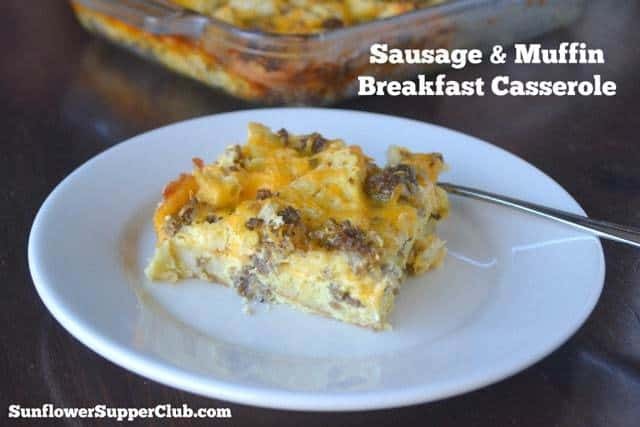 This breakfast casserole is one of those old classics that is so simple to throw together. I love that it is best made the night before baking. When we have a house full of teenagers who don’t get up very early, I can throw it in the oven when they appear or we decide they need to get up. Hope you’ve been well and I promise we will do a better job of sharing more delicious food with you. Cut each muffin in half horizontally and then each half into 6 pieces. Layer ½ of the muffin pieces in a greased 9 x 13” Pyrex dish. Sprinkle with ½ of the cooked sausage and cheese. Repeat layers with the remaining muffin pieces, sausage and cheese. In a medium bowl, whisk together the eggs, milk, onion powder, hot sauce and kosher salt. Pour the egg mixture evenly over the top of the casserole. Cover with plastic wrap and put in the fridge overnight or at least for a couple of hours. Bake in a 350 degree oven for about 45 minutes. Tent the casserole with foil if the top starts to get too brown. Sounds yummy Kim! I’ve never made a casserole with English muffins..interesting! Sounds like you’ve had tons of fun with your girls! Great! I’ve stepped back from my blog indefinitely..feels good but I do miss the interaction with blogging buds. We gotta keep first things first. Happy new year! Can we even believe February is right around the corner? ?? So great to hear from you Marsha! I feel a little out of it as well. I just don’t even get on the computer as much. I’m going to try and post a little because I enjoy it, but I think I was putting too much pressure on myself. Hope all is well with you and your hubby! Happy New Year to you as well! I make a very similar casserole but I add a can of chopped green chiles and serve with salsa. Yum! That sounds delicious Lisa. I am definitely trying your additions. Hope all is well with your guys!